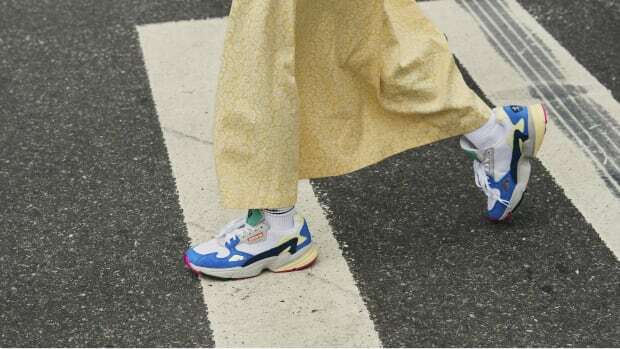 Georgina James can clearly recall the very first pair of Nike sneakers — Air Max BW in white and gray — that she saved up for. "I remember putting them on and feeling like I was amazing and I could accomplish anything," she says. 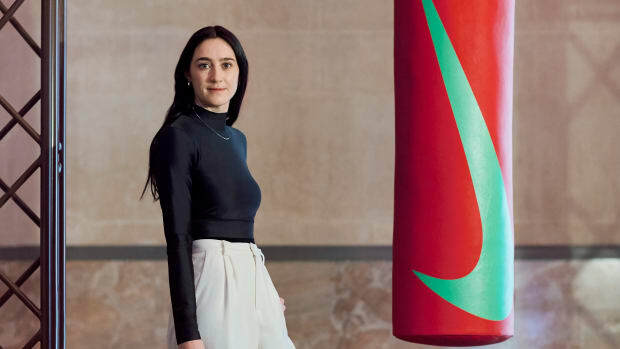 So it&apos;s almost serendipitous that the majority of her career has been spent designing for Nike, where she&apos;s currently the creative director of Nike Women&apos;s footwear. While growing up in the UK, James was always interested in fashion, which led to her study both fashion and footwear design at the Cordwainers College of Art and Design. Before Nike, she created shoes for brands like Kangol, Lacoste and JD Sports. But it&apos;s her passion for sport and working to build functional products to help solve a problem, especially for women, that has helped her thrive for so long — 12 years and counting — at the global sports brand. 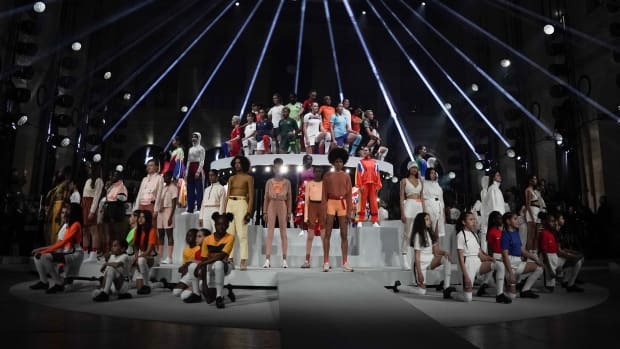 "You get the feeling when you&apos;re designing that you&apos;re really empowering women to do sport and helping to change their lives," says James, who calls Nike&apos;s 1 Reimagined launch in 2018 one of her career highlights. "That gives you a sense of achievement and being proud about what you&apos;re doing, and really believing in the reason behind what you&apos;re doing." 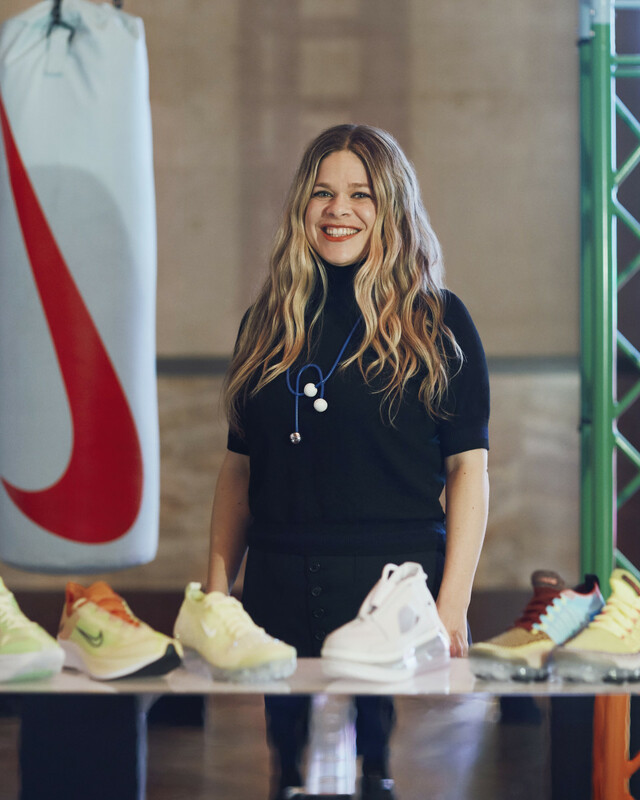 While in Paris during Nike Women&apos;s reveal of its national team soccer kits for the World Cup in March, we sat down with James to learn more about how she broke into the fashion industry, how her role has evolved at Nike and her thoughts on sneaker culture. Read on for the highlights of our conversation. I was, actually, yes. I wanted to be a fashion designer since I was young. I remember one of my first memories: I was probably 10 or 11 and I had a book about learning how to fashion design. You had a template and you had to draw over these women figures. I remember designing a pair of black-and-gold flat pumps. I&apos;ve always been interested in fashion and Nike has been a great place for my career and to express my creativity. We have amazing women and an amazingly talented group of designers from all different backgrounds. I&apos;m so lucky to be here. What would you consider your first break into the industry after studying design? Probably an internship I did with a snowboard company. I&apos;ve always been really interested in designing for sport and designing to solve for a problem. That&apos;s also why I love working for Nike because, as well as style, you&apos;re solving for a function, solving for an athlete. You&apos;ve been with Nike for over a decade. How did you start there and how has your job evolved there? I flew out to the U.S. on a business trip and got to the Nike headquarters [in Portland], and saw how amazing it was and what the opportunity could be there and that was it. I was like, &apos;Okay, I&apos;m moving to the States, I need to go to the States.&apos; I worked for an area that focused on design for Europe for a couple of years, and then I worked on an area that was all about the icons in the company, so looking at like our biggest Air Max shoes, our biggest Air Force Ones, models like the Dunk, and redesigning those for sportswear. From there I wanted to diversify my career a little bit, so I went into performance design. I worked in women&apos;s training for a while; it was an amazing three years and I got to design products for women, which was great. It&apos;s something that I&apos;m really passionate about. I designed the Studio Wrap when I was in training and that inspired me to innovate for women and think about products differently and how you bring performance and style together for all the different sports and all of the different kinds of styles that she wants in lifestyle. How big is the team that you oversee? I oversee all of women&apos;s footwear, so I have an enormous team of passionate women and men that obsess with product day in, day out. We&apos;re looking at products that are unique for her, giving her access to inclusive sizing and really obsessing about her. There&apos;s too many to mention really; there&apos;s so much expertise at Nike. That&apos;s my favorite thing: There&apos;s no other company in the world that has the talent and the designers that Nike does. It&apos;s like an embarrassment of riches. If you want to know about something, there&apos;s always someone to go to that has this huge amount of knowledge on a subject. How do you stay inspired or challenged to innovate and design? One of my favorite things about working at Nike is the amazing talent that I&apos;m surrounded by every day. YWe have so much up-and-coming talent and so many people that have been there as long as I have. It&apos;s the kind of mix of all that amazing expertise and all that amazing young talent, it&apos;s buzzing around you at all times. So that&apos;s one thing that helps, you can&apos;t not see amazing stuff every day. Also, we get to travel to some of our global cities. This is probably the third or fourth time I&apos;ve been to Paris this year. We&apos;re really lucky we get to travel all over the world. We go to New York, we go to Asia, we go to Europe, as well, and just soak up the environment, see what the consumers are doing, see what the look of trends are and how they&apos;re shifting. Can you talk a little bit about the types of sneaker cultures you see around the world? It&apos;s different in every city and that&apos;s what&apos;s exciting. If you go to London, there definitely is a big sneaker culture scene there, and then if you go to Paris, there&apos;s a different sneaker culture, and if you go to Seoul, there&apos;s another one. It&apos;s like looking at how a consumer wears products in different ways that is so interesting, and how you can design for all those different people. Sneaker culture is an amazing thing right now. It&apos;s also growing for women and they&apos;re starting to find their voice in streetwear and bringing femininity to streetwear, and really affecting how trends are changing and leading in that space. It&apos;s a really exciting time to be working on women&apos;s product and focusing on that. Sneaker culture is so rooted online and in social media these days. Do you think a sneaker designer&apos;s career trajectory now is any different than when you first started out? That&apos;s a good question. The fact that social media is so prevalent and women are finding their voice through it, I think it&apos;s an exciting time to be working in sneakers now. When I started, it was still exciting but it was just different. We didn&apos;t have social media. Things are so quick now. People see ideas and they&apos;re latching onto stuff so quick and they want newer more often, better and quicker. So I think it&apos;s just faster now than it was when I started. If you had any advice for someone looking to get into footwear design, what would it be? Follow your dreams and go for it. Work hard and know what you want, and know there&apos;s amazing opportunities out there. Come to Nike. It&apos;s a great place to work.